1 – Updates to the referral program. Thousands of investors are currently benefitting from our referral program. Over the past couple of months, we relentlessly gathered feedback from these investors to find out the main things that we should improve and make it even easier for you to refer your friends, family and colleagues to Bondora. You will now find an improved reporting section helping you to keep track of who you referred, who has registered, who was signed up and your earnings. Also, you will now receive your bonus payment immediately after the 30 day period passes and the calculation has been made. 2 – Simpler user interface. We’re working on keeping it simple. More specifically, we are splitting our core functionality (Bondora dashboard, Portfolio Manager, transaction confirmations and Portfolio Pro), to their own pages and updating the look and feel of these to make them easier to understand. 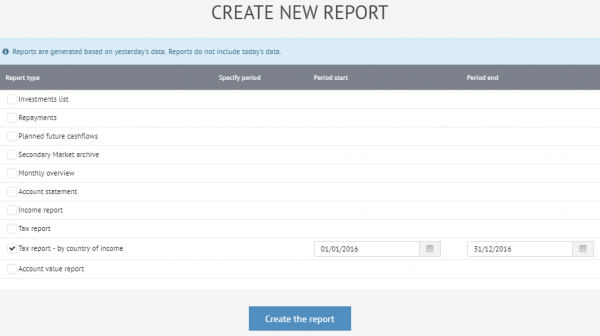 3 – Customisable tax reports. We have recently released a beta version of the new tax report, configurable through the settings icon on the top right of your reports page. We expect this to be especially useful due to the nature of different tax laws in countries all over the world, so you can now configure which fields are shown on the report relative to the requirements of your local tax office*. For example, you can now create a report which shows the income received from your investments broken down in to separate countries. Watch out for future developments to come on this topic. 4 – Weekly and monthly portfolio updates. Some of our customers told us that they prefer to receive weekly or monthly updates instead of daily ones. We’ll soon make it possible for you to configure the frequency of our newsletter as well as its content, tailored to your preferences. 5 – Cash flow forecasting. Many investors use our cash flow forecasting tool to better predict their monthly income as well as their portfolio yield to maturity. We are currently working on making this tool more accurate by increasing the precision of the ratios used (currently these are rounded down to the nearest 5% increment, e.g. 63% is rounded down to 60%) and splitting overdue loans from current loans in forecasts, improving the overall efficiency of the forecast. That’s all for this month, we hope you find the upcoming improvements useful. If there was one thing you could ask us to work on next month, what would it be? Leave us a comment below and let us know. Does that mean that Account statement for last 24 hours” finally get it’s own page?? Thanks for your comment. Yes, we can confirm that the account statement will get its own page and this is planned for release next week.